The modern kitchen in many houses is the hub of the home. We talk about the day with our family, we eat and snack informally and of course we cook. We have every modern appliance going, breakfast bars and islands. With the majority of room taken up by cupboard units at floor and eye level, getting warmth into the room can be problematic. The humble kitchen radiator is almost an afterthought but given the amount of time we spend in the kitchen it shouldn’t be. If you’re planning a new kitchen then this blog post is for you. If you’re trying to shoe horn a new radiator in with a decent output as a replacement for that ugly white panel affair then this is also for you. 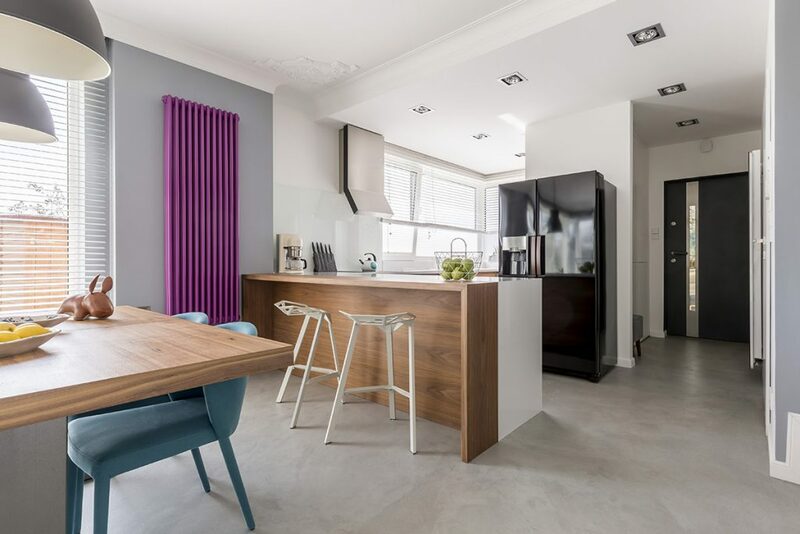 Here are 5 stunning kitchen radiator ideas for the modern home. The Hudson Reed Ceylon has been around for a few years now with minor cosmetic changes being made annually. This year saw the introduction of the optional chrome towel rail. This can be moved up and down or taken off completely. You’d be surprised at how many people want a kitchen radiator with a towel rail – hopefully not for manky tea-towels. This beautiful flat panel design has matured into a design that has proven popular in hallways, living rooms and of course the kitchen. The unobtrusive design lends itself perfectly to kitchen heating. The flat panel hugs the wall and the dark matt finish looks contemporary but understated. The aluminium construction and the black finish also combine to make a supremely efficient radiator that is both quick to heat up and great at kicking out the BTU’s. If you have the room, 370mm wide x 1800mm tall, then the Ceylon is worth considering. 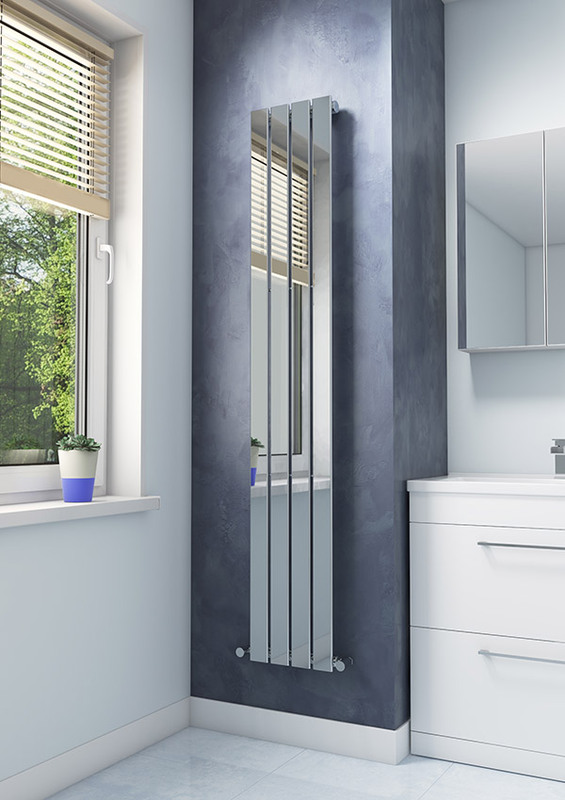 The Aquatech Merano flat panel radiator is available in 3 widths, 300mm, 376mm and 452mm. All 3 models are 1800mm high. 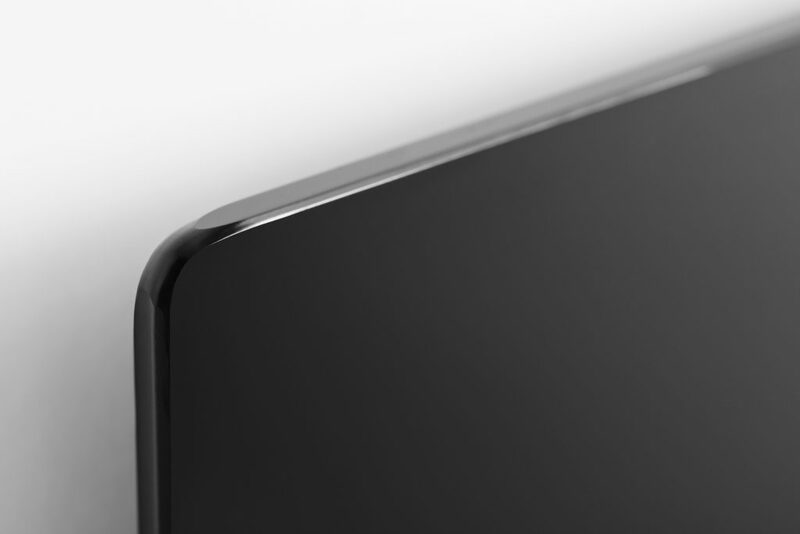 This means even the slimmest design with 4 separate panels, shown in the image above, has a 1459BTU output and will be more than adequate for heating a kitchen. The largest 6 panel model will certainly take the chill out of the air with it’s huge 2189BTU output. What really grabs our attention though is the stunning chrome finish. On towel rails the reflection distorts and offers a blend of interesting fragments from around the room. The Merano with it’s flat panels offers a crystal clear reflection. It’s not quite a mirror but it’s none the less intriguing. The added benefit is that in a dark corner of a kitchen the Merano introduces light and also reflects it around the room, much the same as a mirror can in any other part of the house. Because it’s highly reflective it also introduces the illusion of extra space. 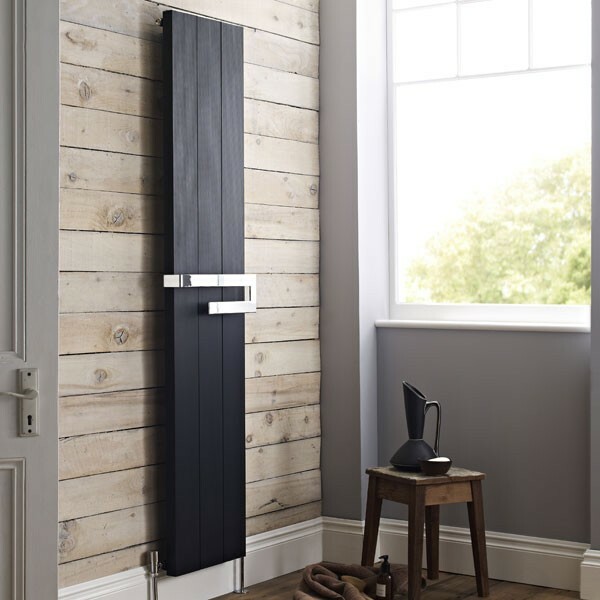 If you’re looking for tall kitchen radiators with a high heat output then the chrome Merano is certainly worth a look. It’s also a model which is very keenly priced. 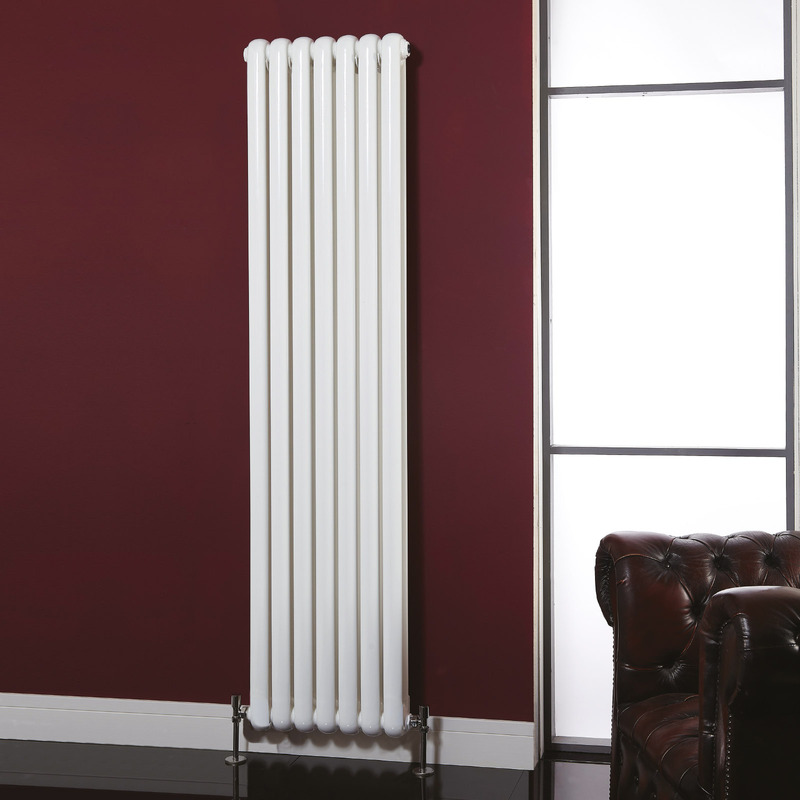 The Tilbrook from big radiator brand Ultraheat is available in 3 heights and no less than 9 widths. That’s 27 models in total. Of course you can install the Tilbrook throughout the home but what makes it perfect for the kitchen is the range of sizes. The slimmest is just 106mm wide and 1500mm tall yet still offers a decent BTU output of 1527. If you have a little more width available the 156mm wide model at 2000mm in height offers a whopping 3053BTU output. Both of these will fit behind a door or in that tiny gap between your units and the white goods, you get the idea. While most buyers will install the Tilbrook vertically it can also be mounted horizontally. This makes more sense for the wider models that can really kick out some heat – the largest size has an output of over 10,000BTU’s. If you need to work out the ideal BTU rating for your space head on over to our BTU calculator. We opened this post by talking about how cramped our kitchens are in Britain. The radiators we have looked at so far all need to connect to a central heating system which means pipe work and fittings. These often need to be installed at ground level. For a complete alternative why not consider Infrared Heating Panels? If you only need a small kitchen radiator, and perhaps you’d like to mount this high up on the wall, then an Infrared option might be just the job. Infrared panels are electrically powered. You can simply plug them in or they can be permanently installed with their own wiring. The smallest panel measures 600x550mm. This has a heat output of around 450 Watts, that’s the equivalent of over 1500 BTU’s, not bad from such a small panel. Larger panels are available though if you have the space including a tall slim option. The models from Hudson Reed are available in white or black and the surface is actually made of glass. 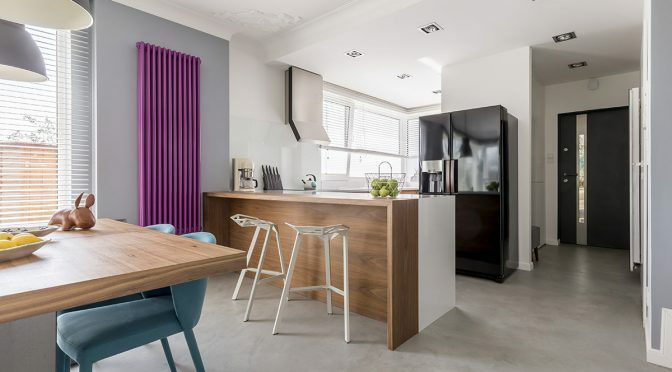 These designer radiators look great in a contemporary designed kitchen. The popular Lilly range from Phoenix UK is available in 12 sizes. These are sizes that are practical for many homes in the UK not just those unobtainable designer home you see in magazines. The Lilly range is available in white or a modern anthracite colour. For kitchens many will opt for the slim 318mm wide model which is 1800mm high. This kicks out over 4400 BTU’s more than any design we’ve looked at so far. This is thanks to the double column radiator design that affords the Lilly a huge surface area. Like many models on the market the Lilly also has the option of a chrome towel rail. A practical addition for the kitchen or bathroom. The beauty of the Lilly though is that the column design is suitable for any room in the house. Furthermore if you don’t have a load bearing wall available fear not as optional floor mounting legs are also available for the Lilly. This puts the weight of this mild steel product onto the floor rather than the wall. This brief look at what’s on the market has revealed lots of options for heating kitchens. 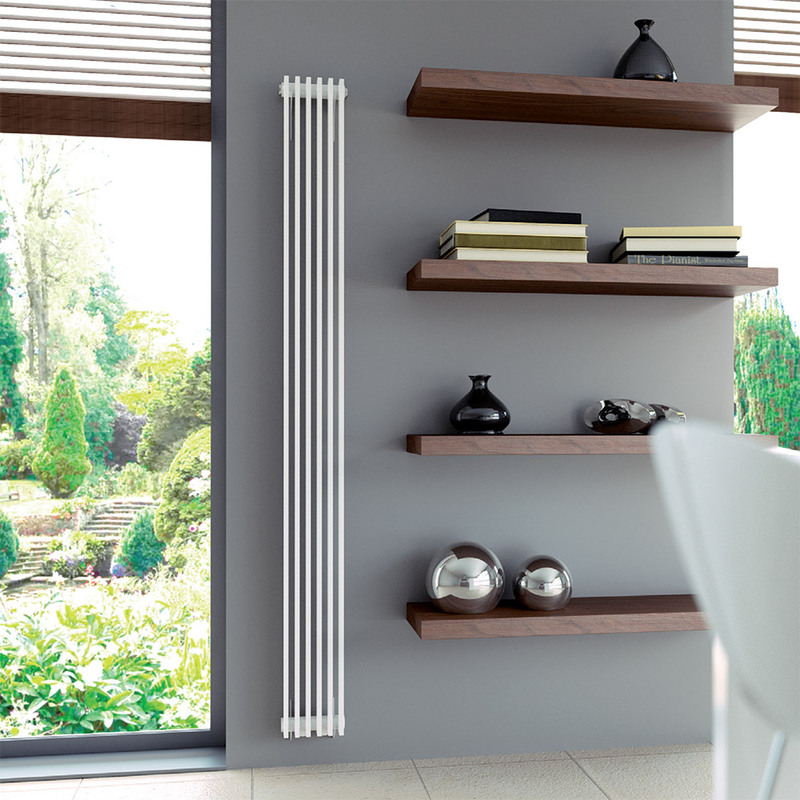 Of the many designer kitchen radiators there are also fairly practical for a wide range of homes. This is really important. For general advice on choosing the perfect size radiator head on over to our thorough guide. This looks at everything from how the finish, material and colour can effect heat output as well as size and spatial considerations. Do any of these vertical radiator options appeal to you? Let us know in the comments below. We’d also love to see the choices you go with, feel free to send in images of your modern kitchen radiators and we’ll feature it on this page.